If you’re looking for an afternoon of drama, intrigue, and high emotional intensity, look no further than Clark’s Elioak Farm in Ellicott City, MD. Keep in mind, though, that these feelings you’ll experience have absolutely nothing to do with the venue itself, and everything to do with the toddler you take with you! Ha! I first discovered Clark’s Elioak Farm when I attended my niece’s birthday party there a few years ago. At the time, the young man was already a teen, so I didn’t have a child of appropriate age to take with me, or back for another visit; but I was excited for Hubs and I to take Brooklyn this fall, hoping she would really understand and appreciate all it has to offer. What does the farm have to offer, you ask? 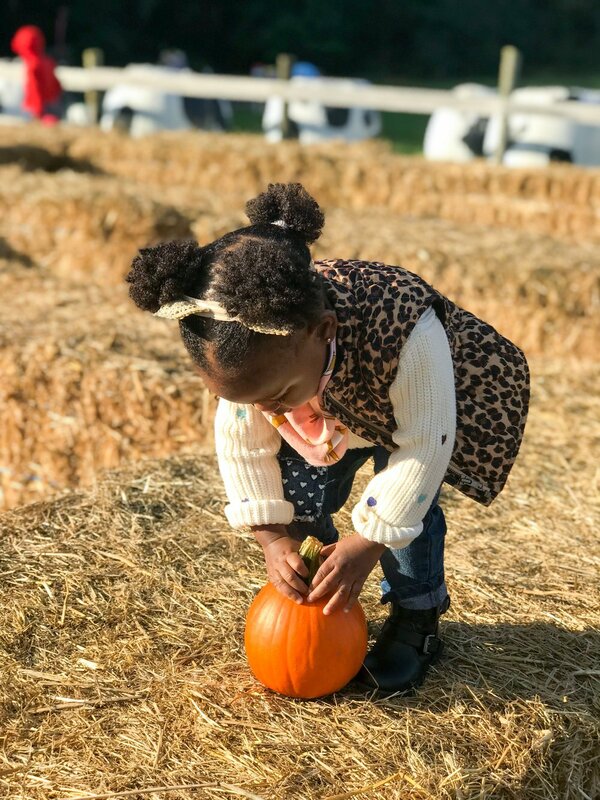 Everything from hayrides and a pumpkin patch, to a kids’ corn maze, an enchanted forest, train rides, pony rides and a petting zoo. It’s a kid’s fall fun fantasy! They also have special activities like face painting & pumpkin painting, food for sale and a picnic area where you can take a break and have a snack either from their concessions, or something that you’ve brought yourself. We packed snacks for Brooklyn, an absolute must in our toddler tantrum management kit, a.k.a. my mama backpack (currently a simple but stylish faux leather find from Target). There’s a nominal entrance fee of $7.50 per person, and a hayride is included in that, and at entry you can also purchase tickets for some of the attractions that have an additional fee like pony rides and the petting zoo. We learned this the hard way when we got in line for Brooklyn’s pony ride, only for Hubs to have to schlep back to the entry to buy a ticket. A minor inconvenience but you can save some time knowing that in advance. If you know you’ll be picking pumpkins from the patch you can pay for those in advance too, or you can pay on the way out, which is what we opted to do after we picked Brooklyn’s. So how did Brooklyn appreciate Clark’s Elioak Farm and all its fall fun attractions? Well, she was really into the gravel paths (not an actual attraction, mind you), because she’s a big fan of rocks; and she loved the multiple kiddie slides in varying heights and set ups. They have these cute little play areas peppered in different spots along the farm, and she was particularly partial to the wooden ship slide, and the slide out of the shoe belonging to the Old Lady Who Lived In a Shoe (from the nursery rhyme). She ran around in the kids’ corn maze so much that she got hot and had to come out of her handkerchief bib and leopard vest! Sitting on top of the bales of hay and rolling her new pumpkin around like a ball scored high marks in entertainment with her. However, Brooklyn was NOT at all here for the hayride. She laid down on my chest the entire time and refused to look at any of the cute little things, like scarecrows and fake bears and MD nostalgia, that they had set up along the ride route. She was not even THINKING about setting foot down on the ground in that pumpkin patch, and any time I tried to coax her into it she would latch onto me like Velcro, and there was no separating us. She was fine with looking around, but she was not touching! The pony ride started out well, but I sensed something going wrong a few seconds in when she literally tried to throw herself backwards off that cute little pony. Thank goodness Hubs was walking along side her and got her righted and situated back in the harness without incident. After that we kinda figured MORE animals, no matter how cute, were probably a bad idea so we skipped the petting zoo. Overall, despite a few minor toddler meltdowns, we had a really good time outside in the crisp air and temps that finally actually feel like fall, and with all the running across the grass this activity wore Brooklyn out, and made her really tired for bedtime which is always a plus. I think we could’ve avoided some of the meltdowns though if we had gone earlier in the day before nap time, as opposed to in between nap time and bed time, so that was a lesson learned for us. We’re excited to go back next year when she’s a little older, and we’re a little wiser! I highly recommend it if you’re looking for something seasonal to do with your family in the Baltimore area on the weekend.